Are Russian BMPT-72 “Terminator” Tank Support Combat Vehicles Slated to be Deployed in Syria? Early July 2017 saw the release of photos showing a single BMPT-72 “Terminator” tank support combat vehicle in service with the Liva al-Quds Palestinian brigade serving with Syrian government forces. So far there have been no indications the vehicle has seen combat use, and it also appears that the vehicle was sent to Syria mainly for combat evaluation rather than in response to any urgent tactical requirement. The BMPT concept represents an answer to the need to provide a high volume of suppressive fire against enemy anti-tank guided weapons and static weapon emplacements such as machine-gun nests. While modern infantry fighting vehicles are usually armed with automatic cannon which can fill that function, their inferior level of protection means they are hard-pressed to truly accompany tanks and are instead forced to provide overwatch fire with anti-tank guided missiles which limits their ability to use their cannon. The use of anti-aircraft weapons, either purpose-designed vehicles or gun trucks with towed anti-aircraft guns mounted on their platforms, suffers from a similar limitation. The only way to get around these problems, which Russian forces discovered when fighting in Afghanistan and Chechnya, is to develop a heavily armored vehicle that replaces a tank’s main gun with automatic cannon. This vehicle was Obyekt 199 “Ramka”, which over the years matured into the BMPT-72. BMPT-72 is, as the name implies, based on the successful and popular T-72 main battle tank chassis. This choice facilitates integration into T-72 tank formations from the perspective of mobility, maintenance, and training. Its armament consists of two 2A42 30mm automatic cannon with a total of 850 rounds in the turret, and two AG-30 30mm automatic grenade launchers mounted over the tracks and controlled by the two “bow gunners.” To deal with long-range threats, the vehicle carries four ready-to-fire 9M120 Ataka laser-guided supersonic anti-tank missiles with a range of up to 10km in the case of the most recent models and carrying either HEAT or thermobaric warheads, depending on mission requirements. As of early 2017, the BMPT-72 is officially in service only with the armed forces of Kazakhtan, which took the receipt of 10 such vehicles between 2011 and 2013. 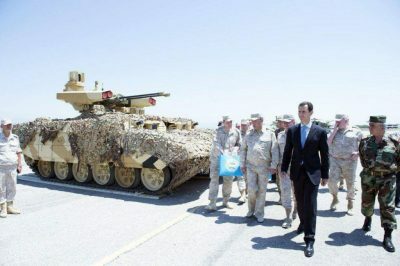 The vehicle spotted in Syria deviates slightly from the Kazakhstani vehicles in that it carries only a low-light image intensification sight rather than a thermal imager, which makes the vehicle less expensive and is not a great handicap in Syrian conditions where it is not expected to fight duels with advanced MBTs equipped with thermal imagers. Its protection is also different in that it carries Relikt second-generation reactive armor and soft armor packages protecting the sides so far seen only on up-armored T-72B3 tanks in Russian and Belarusian service. BMPT-72’s appearance in Syria coincided with reports that the Russian Ground Forces are about to procure a number of these vehicles themselves, most likely for use by brigades and divisions operating T-72 and T-90 MBTs. BMPT-72 was not part of earlier procurement plans because it was expected that units equipped with the new T-14 MBT of the Armata family will also include the T-15 heavy infantry fighting which was designed in part to fill the same niche as the BMPT. The T-15 prototypes shown at the 2015 Victory Parade carried an unmanned turret with a single 30mm cannon and 4 Kornet ATGMs, and automatic cannon with caliber of up to 57mm are known to be in development and testing for use on the T-15 and other IFVs. However, the expansion of the size of the Ground Forces meant that T-72 and T-90 MBTs would remain in service for longer than expected, which in turn revived Russian interest in procuring the BMPT-72.